A tic tac box is shown empty all the way around. You take the coin and slam it on the tic tac box. You can see and hear the coin melting through the plastic and end up inside the container. Your hands are clean after the coin penetrates the box. Immediately give away the box with the coin inside to your spectator. There's nothing to find out. Your spectators can keep the tic tac with the coin trapped inside. Forget everything you have seen. Give away the tic tac with the coin! The effect is simple and very effective. Anyone can perform this truly amazing miracle. 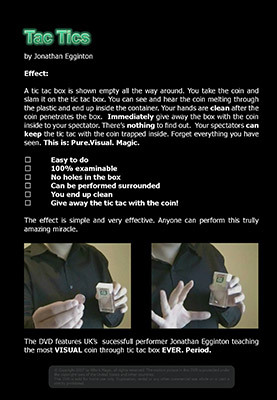 The DVD features UK's successful performer Jonathan Egginton teaching the most VISUAL coin through tic tac box EVER. Period.